While soring is only done by a small percentage of trainers in certain show divisions, the cruel practice has cast a shadow over the entire gaited horse world, particularly Tennessee Walking Horse shows. In 1970, Congress passed the Horse Protection Act to eliminate the cruel practice of soring, which had become a major issue at some Tennessee Walking Horse and other gaited horse shows. Under the act, U.S. Department of Agriculture (USDA) inspectors and inspectors from certified Horse Industry Organizations (HIO) examine horses at competitions to determine whether they have been subjected to painful practices to exaggerate their high, reaching stride. More than 40 years later, the problem of soring persists, with violators finding new ways to get around inspections. The USDA’s Animal and Plant Health Inspection Service (APHIS) will be hosting a series of listening sessions over the next months to get feedback from the public on the current state of the Horse Protection Program and what can be done to make it more effective in the future. How close are we to eliminating soring? 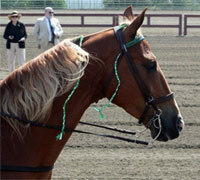 Can the Walking Horse industry come together to consistently self-regulate and enforce the Horse Protection Act? What responsibilities should USDA certified HIOs have? How can the Walking Horse industry reconcile the interests of competition and ensuring compliance with the HPA? What can the USDA do to ensure compliance with the HPA? What responsibilities should the USDA have in enforcing the HPA, and what hinders the USDA’s oversight of the Walking Horse industry? Should there be a prohibition on action devices (typically chains worn around the pasterns) or of padded shoes? Should the HPA shoe weight limits on yearlings be extended to horses of all ages? I’m really glad to see that the USDA isn’t giving up on this. It’s definitely still a problem. I have a 9 year old walker who was sored, and while he wasn’t a horrible case, it certainly had a lasting effect on him. however, I think that there need to be harsher penalties not only for the walking horse industry, but against other forms of abuse perpetrated against show horses – such as tying up necks, rollkur, tail blocks, etc. Abuse of animals is never acceptable, but show horses at public facilities and/or sanctioned venues are a good place to start, and there’s precedent to support legislation dealing with the issue. This practice is so cruel. It should definantly be put to a stop. Soring is a perfect example of the poorest horsemanship possible. Keep trying to put it to a stop, USDA!!! Why are owners that have “soared” allowed to be in a show anyway? If they can’t get into the show ring, why soar. This should no longer be going on. Anyone who is cruel to animals should not be around them. Hello. I live in Jackson, Mississippi. There is a horse on the east side of Hwy 49N, just south of Gary Rd. The horse obviously has something very wrong with its leg. I’m no expert, but it also didn’t seem healthy. I hope there is something you can do. Judges and show contestants are aware of this practice and should disallow those participants from entering in competition. It’s the people AT the show who can do something about this! How Tight Should a Cinch Be?